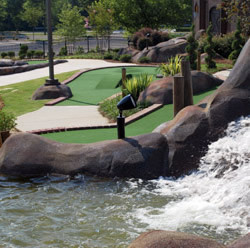 At The Fringe, a section of the popular Area 51 entertainment complex in Roswell, Georgia, you’ll find two family-friendly 18-hole miniature golf courses. 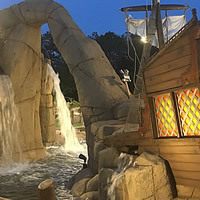 One of the courses has a pirate theme, while the other showcases the history of the area, including Roswell Mill and its ties back to the Civil War (the mills made the "Roswell Gray" fabric for Confederate military uniforms). 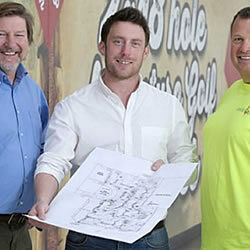 The actual mill sits adjacent to the mini golf course making a round of mini golf both fun and educational. 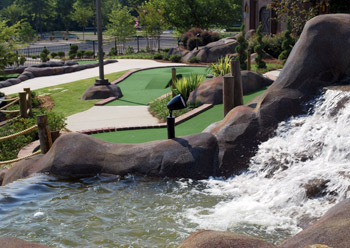 Crave Golf Club in Pigeon Forge, Tennessee opened to sweet reviews in October thanks to obstacles like ice cream cones, candy canes, gumballs and jelly beans. 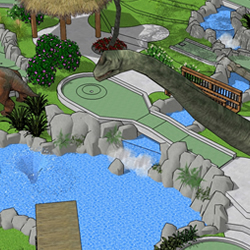 The club boasts two mini golf courses, including a 19-hole two-tier rooftop course and a 19-hole indoor course. 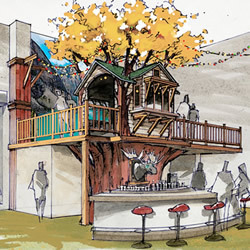 A milkshake bar and a sweet shop loaded with sugary treats ranging from oversize chocolate bars to four-foot pixie sticks will tame even the sweetest of sweet tooths. Take a small-scale tour of Philadelphia as you putt around Philly Mini Golf at Franklin Square in downtown Philadelphia. 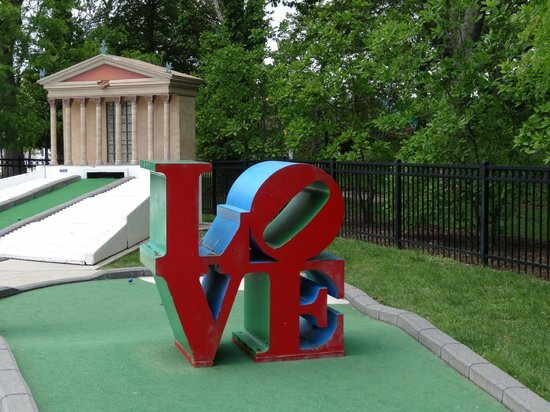 Every hole features one of the city’s historic landmarks, like Independence Hall, the Liberty Bell, the Ben Franklin Bridge and the iconic LOVE statue. Once you’ve finished a round or two, relax by the fountain, take a spin on the carousel or grab a burger and the signature Shake-of-the-Month at SquareBurger. At Duffer’s Mini Golf in Wildwood, N.J., a nautical Finding Nemo-themed mini golf course awaits, complete with chatty pelicans, oversized sharks, an octopus, even a shipwreck. Once you finish putting your way around the course, order up a massive sundae or a banana split at the adjacent ice cream shop. 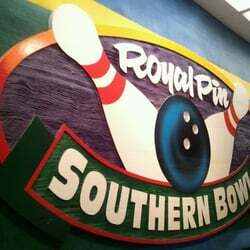 There’s also an arcade and a full-service restaurant at this old-fashioned oasis that’s just a few blocks from the beach. 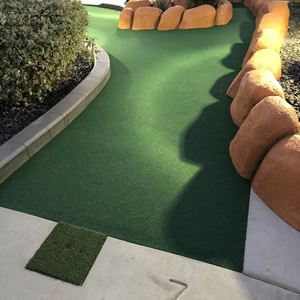 Pelly’s Mini Golf at Del Mar Golf Center in Southern California boasts two 18-hole golf courses sure to please putt-loving families. 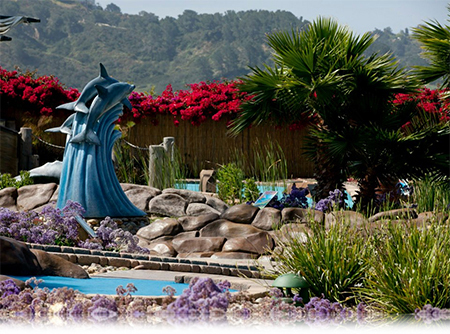 The first, Pelly’s Ocean Adventure, includes 20 sculptures of various marine life, including sharks, dolphins, sea lions, and gray whales, which actually spout water from blowholes. Talk about realistic. The second, Pelly’s Surfin’ Safari, is all about surfing, a favorite SoCal pastime. Blue turf on both courses makes it appear as though players are in the ocean, while drought-tolerant plants and recycled mulch aid in local conservation efforts.